The rope connected us. Tied us together. Inseparable. I’d consider and agonise over its necessity many times in the next week. Ours was beefy, strong, purple. A crossover from the static and predictable world of rockclimbing, not well suited to the wild and dynamic higher mountain. Aspiring. The questioning would reach a crisis at the last throw of the dice. The plan was a good one, to walk in some of the way as the forecast weather cleared, which would give us a shorter day for the main approach to Colin Todd Hut up on the ice plateau. From the Hut we could climb the peak. Rain and storms had swept the South Island as we made last minute preparations and gathered more information. Snow covered the peaks on the drive in to the road head. Creek crossings were a little flooded for the hired corrolla. We left Raspberry Flat at about midday with the showers seeming to retreat up the valley as we walked. The Matukituki River was swollen green with rain and glacial melt water. Through daisies fields and past cows and sheep the flat trail led us to Aspiring Hut where we rested and took stock of the weather. We pushed on relying on the forecast for an improve which it did for a time. Shovel flat, high hanging glaciers, Pearl Flat, wire bridges over streams, into magical mossed beech forest like Middle Earth. We forged ahead through wet scrub on a lesser trail getting saturated. Scott’s Bivvy Rock beckoned us. Alas even the fancy GPS phone navigation app could not help us locate it. We thrashed around looking. Totally buggered. Showers returned. 7.30 pm. In a tussocky clearing we sheltered from the wind behind a clump of bushes and laid out bivvy bags. “I need food”, Tom. We stood around miserable, ate dinner in the rain. I struggled into my goretex bag and wrestled into sleeping bag and dry thermals. Then through the long night I fretted between searching for down soddening drips and leaks and asphyxiating due to lack of oxygen. Showers persisted through the night. Miraculously I stayed dry and warm and alive and welcomed the relief of morning. More sprinkling rain brought a sleep in. The forecast good day did clear a little so between showers we packed up. EVERYONE had advised us not to go up the Bevan Col route in wet conditions so we headed off on a retreat towards the alternative French Ridge Hut which would give us shelter and a chance to dry out, but use up a valuable extra day. Walking down beside the stream within 100 meters of our Bivvy spot we noticed some of the river rocks were drying out. Maybe the notoriously treacherous steep slabby rock would be dry enough to be feasible. 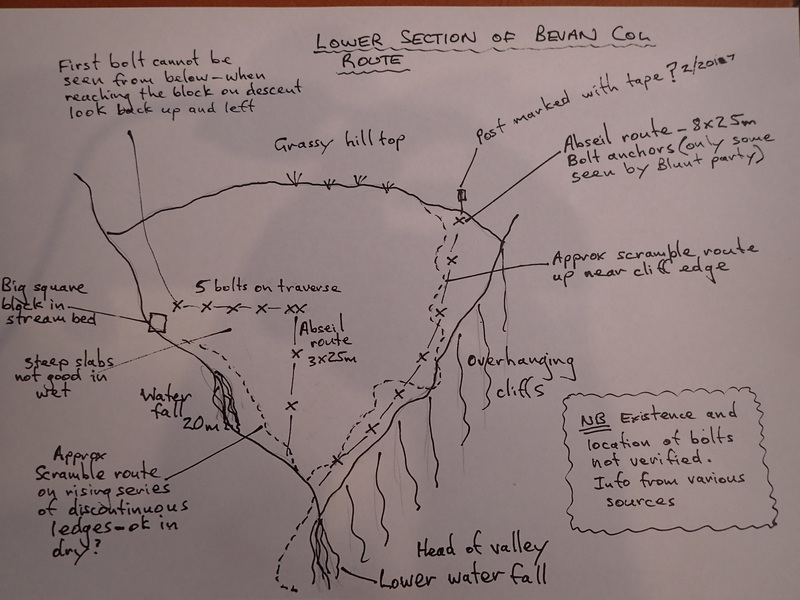 So we decided to change the plan and try for the Bevan Col route. 100 meters up the valley we discovered the palatial, dry (compared to a rainy night in a bag) Scott’s Bivvy rock We could have spent a fun, comfy, dry night holed up in the small shelter under the rock and looked out at the passing showers. We lost the track then and struggled and fought through tangled, wet boulder scrub with the really heavy packs (RHPs) for way too long. The food, fuel, warm clothes, too thick rope, rockclimbing gear, my antique heavyweight ice axes etc etc weighed too much. I thought a lot about Sherpas, porters and people of the past with their heavy loads carried into the mountains as I struggled. I thought about how much work and punishment a body, my body, Tom’s body could take before breaking down. At the “Head of the Valley” we met up with a Canadian couple who had camped for two days waiting for the weather to clear. They somehow exuded mountain competence and experience. Up past the first waterfall all the rock was wet, and steep! The other two started up a low route on a rising traverse of narrow ledges as Tom and I roped up and pitch climbed a section up to and past a bolt, more vertically and closer to the edge of an abyss on the right. The Canadians joined our route and within sight of each other (this leant a significant air of confidence and commeraderie) we decided the rope was unnecessary as there were no real anchors (we didn’t see any more of the abseil route bolts that must have been hidden from us) and the terrain seemed ok. Just! Tussocks and small plants were good to pull up on, the boots edged on small holds and grooves enabled us to balance our loads and teeter upwards as the drop below beckoned with greater height. One section had tricky moves on a ramp overhanging the abyss. Scared. Tenuous. I’d seen a video of a group having an epic descent in heavy rain. They had given up, camped on a small ledge then finally reached the ground next day terrified and drenched. Eventually we made the flat ridge at the top. Flat. Safe. We navigated together then in mist, sharing our info and topo sketches and trying to make sense of the complex terrain. Down a little then up right along a system of slabs which were covered in snow and wet, balancing delicate moves with the RHPs. The slabs dropped off to the valley floor. After crossing a stream gully we slogged up a steep snow gully, sharing the step making effort. Above a buttress we climbed onto a snow arête and saw the Col only a little higher and further over. In a small clearing in the clouds the white summit cap of Aspiring mystically appeared, lit up by the late afternoon sun. As if rewarding us for our effort and risk, and beckoning us on. A moment of clarity and beauty. Our first view of Tititea. It had taken 6 hours to toil up the 950 meters to the Col. Having roped up we crossed our first crevasse within meters of starting down a snow ramp and then onto the Bonner Glacier. It seemed to take forever, slowly plodding across the snow and ice. I focussed my mind on looking out for crevasses and tried ridiculously to step lightly. Following the Canadian’s steps was reassuring but no guarantee. At every step I tried to sense the tension in the rope behind leading to Tom, to be ready to instantly throw myself down and dig my boots into the snow so I could hold his fall through into a hidden canyon of ice. This was our first glacier crossing since our mountaineering course. On our own. At the end of a very long day. Stay switched on. Don’t relax. And hope Tom, at the other end of the rope, was doing the same and was ready if I suddenly holed through to thin air underfoot, that he’d hold me dangling by that thread over the icy void. With RHPs. A final killer 100 meter ascent from the glacier slip sliding up a narrow gully took forever before we reached the rocky domes around the hut. 7.30 pm. Totally spent – physically and mentally. The weather cleared. Aspiring/Tititea is a stunningly beautiful mountain. Any ascent from the valley floor is a huge challenge, nothing is gained easily and the fickle weather dictates the terms. Friends have spent weeks hutted and camped nearby only to return home without having stepped on the mountain. We were trying to make the most of the first period of forecast clear weather for the whole summer season (mid Feb) so far. Boots off. Food. Tea. Dinner. Comfort. Shelter. Relief. Rest. Amazingly at 8.30 pm two fellows arrived who had walked in in one 12 hour push – epic! The Plan – 3 days good weather was forecast – clear, light winds. So far in New Zealand we had only had the occasional good days in amongst atrocious conditions – rain hammering, winds belting. We shared valuable info on possible ways of doing the North West Ridge with the two other pairs. They were on tighter time schedules and aimed to climb the following day. We would trust the weather and have a day to rest and explore to sort out which way we would take, and to familiarise. To sleep, to sleep, dry and long. My heart seemed still to be thumping as I lay in the moonlit hut – altitude (surely not), dehydration, exertion? The “one day walk inners” left at 4.00am and the Canadians, who turned out to be a mountaineering instructor and an Antarctic remote camp supervisor, departed with more confidence at 7.00am. Later on we followed their tracks up the ISO Glacier and then went on to climb on a nearby smaller peak, the Rolling Pin. We returned via the Shipowner Ridge to the hut. Throughout the day Aspiring stood clear and majestic from every vantage point, intimidating, tantalising and always beckoning. Much later than expected we spied both groups near the summit in perfect weather – around 2.30pm. Later still we saw nothing of them. 2 guides arrived with clients who had walked across from the helicopter landing about 2 km away. Then another 2 couples arrived from French Ridge Hut having made it through the Quarterdeck Pass which was normally cut off so late in the summer. Throughout the afternoon I checked on the climbing pairs, seeing nothing, with a growing sense of concern for their safety. 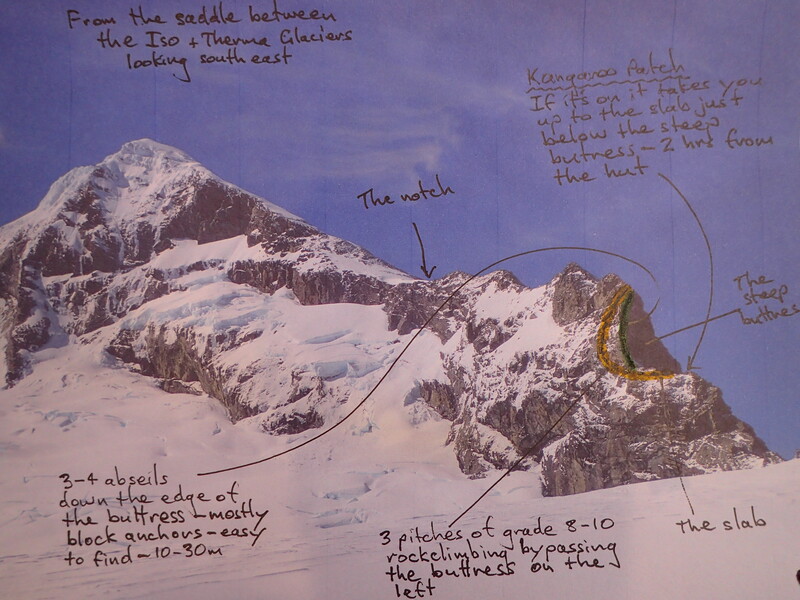 From all our sources of info there seemed to be four main ways to climb the North West Ridge. The “full” NWR – very long and time consuming on the lower third. And we had already done the Shipowner Ridge section. Via the ISO and Therma Glaciers – a quicker way past Shipowner but still slow below the “slab”. Via the Ramp – a steep snow slope overlaying slabs that bypasses all the rock on the ridge – deemed too dangerous due to avalanche risk so late in the season. Via the Kangaroo Patch which is a snow slope leading up to the “slab” at 1/3 height. Late in the day the guides and their clients did a reconnaissance up the Kangaroo Patch, and in the process set a nice set of steps in the steep snow. Based on our own analysis this was also our preferred route. I worried some more about the two climbing parties who were spending so much time on the climb and I considered how remote and isolated they were should anything go wrong. Tom and I carefully prepared for the next day – lunch, gear, rope coiled and set out, bags packed, clothes laid out, boots and crampons readied. It was reassuring to have time to do all this methodically – for our first big mountain. Just like in our training course we had everything ready for “summit day”. We just hoped the weather gamble would still pay off. Eventually one party returned at 8.00 pm. They’d had an epic 16 hour day including having to reverse 4 pitches trying unsuccessfully to do a rising traverse on snow across the slopes above the Therma Glacier. The other party returned at 8.30 – 13 1/2 hours. Tom and we’re both thinking that if these parties had taken so long we would be in for a very long day. It was difficult to get to sleep with the buzz in the overfill hut, and to stay asleep later. Keyed up. I drank water through the night top prehydrate. I awoke before the alarm at 2.50 am, lit the stove and woke Tom. Within 15 minutes there were 5 climbing pairs bustling about. Muesli, 2 cups of tea and another drink of water. Harness on, crampons, backpack, axe, rope. First out the door. A slowly moving set of tiny headlamps followed up the crunchy set of steps under moonlight and a canopy of stars. At 6.00 we reached the slab. At its left edge we climbed a short easy pitch up the ridge as the other parties got going, and then traversed round left onto the open face. The sky lightened a little. Fears of a bottleneck on the rock dissipated as parties climbed around each other on the fairly straightforward rock. Friendly and unhurried, waiting, moving aside, cheery chat. We made up a commeraderie of climbers from Australia, New Zealand, France, Peru and Italy. It was like a day out on a popular crag – on the “Matterhorn of the Southern Alps”, surrounded by now pink tinged snowy peaks and plunging dark valleys and glaciers and snow all around and below. 3 pitches of roped rock climbing on the left hand face (looking up) brought us back onto the ridge proper. I felt at home on the rock – on familiar ground. We were going well. Tom and I moved efficiently together. The practice climbing we’d done was paying off. I laughed and chattered and waved to the other groups nearby. For a time we simulclimbed the rocky ridge with 20m of rope between us threaded round blocks and through gaps in the rock. On both sides verticality plummeted away to steep snow and ice below the cliffs. The sun goldened the surrounding peaks and ranges. The two guided parties dropped behind and one pair went in front. At 8.30 am we reached the “notch”, a low gap between the rocky lower ridge and the snow and ice of the summit section. Morning tea, stash the rock gear and some water for the descent. We removed the rope as the snow looked straightforward and consistent. Without anchors and belays, which would have taken too much time, any slip or mistake by one of us would mean the end for both if we had remained roped together. I remembered a line from my course, “If you’re not attached to the mountain the rope is a danger to you both”. Crampons back on we made our way up. Stepped up slowly through the snowfields. As the angle steepened I zigzagged a slow and careful ascent. The ground and snow continued to be fine for well placed steps, driving the side points into the surface for maximum grip. Over near the right edge Where cliffs dropped away I was able to spy another group on the near vertical ice couloir section of the South West Ridge. Higher up my mind played tricks with the numbers I had written down as staging points. Tom’s altimeter had us at 2870m which I calculated at about 500m still to go but I could hear whoops and see helmeted heads peering over at us from not very far above. The summit ice steepened but it was still ok for us to safely solo so we made our way up subtle slightly lower angled ramps and then out left a little. And then there it was. 10 m away. The others were taking photos of us as we made the final few steps. I was overcome. I had to hug and shake hands with everyone. Reaching a dream that had percolated for forty years happens only rarely. Time and health and loved ones and the world has to come together in a special combination in that one place at that one moment. The world is indeed a wonderful place. Peaks and lakes and glaciers and valleys and ice and snow and rock blazed with light everywhere. In certain moments time and life is concentrated in sublime adventure. 10.30 am. We photoed and laughed and lunched in perfect windless calm on Tititea’s mountain top. The south west ridge pair appeared to join the merry throng. In a quiet moment Tom and I shook hands in a gesture of thanks to one another for sharing the climb and for making it possible for each other. Down – switch on again. The ascent is only half the climb. We stepped down the icy sastrugi, slow, measured steps, taking lines that gave the greatest chance of a self arrest should we make a mistake. Minds off the view, eyes locked on feet. Concentrating hard not to tanglefoot or catch a crampon strap. Back at the notch I collected the rock gear. Six of us scrambled back along the narrow rocky ridge together. Awkward moves over the left or right faces or along the actual crest. Up and down. The axes came out for a steep short icy section and the rope for a snow slope protected with an old piton. At the base of the steep buttress now 8 of us shared ropes and chatted as we abseiled 4 rapells in happy company together. Then all safely back at the slab we descended at our own pace in pairs roped together against the hidden crevasses in the softer afternoon snow. Back to the hut. 3.30pm. I was tired but not buggered. The climb had been splendid. Easier and less nerve wracking than anything on the Bevan Col route, which was true to popular legend. All our skills had been brought out, but we had not been pushed out of our comfort zones. Bit by bit, section by section, it had all been OK. Tea. Boots off. Rest in the warm sun. Inner glow. Food. A tepid bath in a secluded pond in the rocky knolls nearby – heated by the sun, clean and washed, then lie on the warm stone, naked before the stupendous landscape and the sun. Best bath ever. The guided parties arrived over dinner. Our thoughts turned to the next stage – getting down to the valley. The Bevan Col route filled us with dread even on dry rock so we opted for French Ridge via the Quarterdeck – in spite of the crevasse stories. Another up at 4.30am and depart at 5.30 morning. We hoped for firm snow in the cold morning. We plodded back across the Bonner then did a slow climb to the higher part of the glacier between ice falls. The blue ice rose like a silent, slow moving wave in front of us. The sun touched the South West face of Aspiring. We trudged upwards, the packs a little lighter. A long uphill in the sun and glare took us to the snowy pass of the Quarterdeck which led down to French Ridge and the safety of hiking trails. It’s never over till that lady sings and I couldn’t hear any notes in the breeze. We had also left early to go through the Quarterdeck icefall before the sun softened everything up. So a quick stuff of the face with food and we were off. It was firm and hard still. A little scarey. Down steeply, then across a huge crevasse at the edge of the cliff above Gloomy Gorge, down some more, over (just!) a crevasse with a large foot hole, down, gingerly across then onto a steep section of ice. We front pointed sideways on frozen toe holes from previous climbers. Committed, we continued across then diagonally down. The ice axe pick dug in deep with each step. A massive yawning crevasse waited 30 meters of steep ice below. This was much harder than anything on the climb, the course or even Bevan Col. Trust your buddy. Front point down, some more, careful. I could see the bottom. Concentrate. Tom’s crampon came loose. I dug a little stance for myself and tried to ram my axe handle into the ice for an anchor, unsuccessfully. Tom stayed in control, balanced with his pack on, ice axe dug in, and carefully reattached it. Trust. Don’t fall now. Ice screws were in the bottom of the pack, unavailable. The rescue knife that could have cut us free from one another lay forgotten at the back of my harness. We didn’t both have to go. Then down a step at a time. Eventually onto softer then less steeply angled snow and finally to the bottom. Release. Relief. A close call, just in control, there’s a very fine edge between safety and danger sometimes. Lunch on a sunny rock. A pair of tar scampered over the snow. Valleys. Mountains. Down snow then scree and rock and into alpine grassland. French Ridge Hut. Tea. Views. Keas. Muesli leftovers for a second lunch. Waterfalls tumbled from hanging glaciers everywhere into the valleys. Their constant murmur, a low hum, sounded like it could be the lady’s song at last. Down, down, down. In the dark (it’s a habit now) to reduce the risk of getting stuck in the carpark due to flooded streams from the forecast afternoon rain. Down from the bright red hut. The descent track hugged the edge of the drop into Gorge. Tangled roots provided hand and foot holds. Into the beech forest at last. Careful not to twist a knee or ankle. The stream at the bottom, 900 m below the hut, tumbled and churned glacial green and silver over boulders beside mossed trees. Rest, eat, recuperate. Along the valley floor the track wound back in and out of the forest and daisy fields. At regular rest stops we looked back and far above to the mountain top visible above the ice of the Breakaway. High, aloof, imposing, now with a wind blown cloud plume in the deteriorating weather. We passed by a variety of people, hikers from across the world, the DOC hut warden off to catch and band robins. 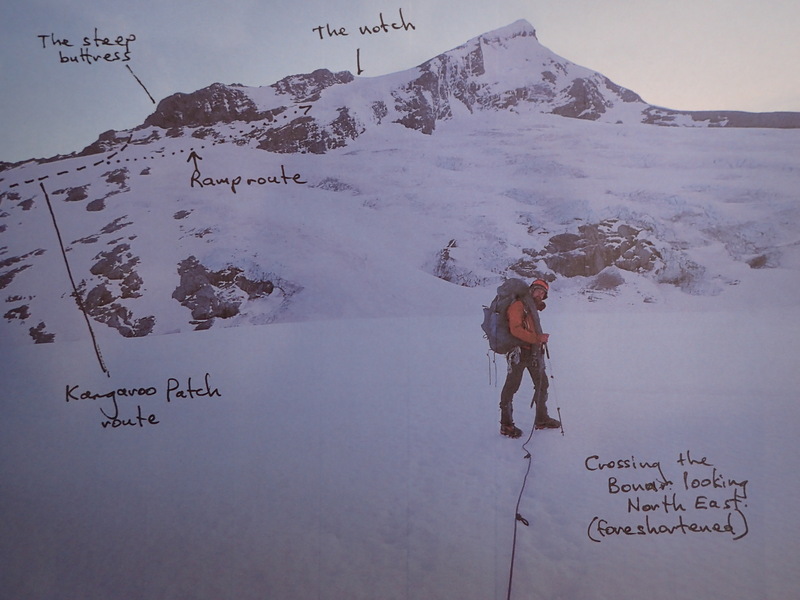 And at Aspiring Hut a pair of seasoned climbers, “Aspiring is probably the finest mountain in New Zealand”. And a group of exuberant young adults who had mountain biked into the clearing to lunch and rest. A similar age to the students I had worked with for many years I struck up a conversation with a bubbly guy and girl at the table where I was tying up my pack. I learned that they were a group from Mount Aspiring College out on an outdoor trip for the day. “I want to climb Mount Aspiring in 2019. It’s my aim”, the shining young man told us with a determined and hopeful grin while pointing up the valley from where we’ve come. “Good luck and good on you”, I responded and thought ‘may the force be with you and may the lady of the waterfalls sing your safe and exuberant return from the journey’. In this brief interchange I sensed a strong connection through a wrinkle in time, a reflection of my self across the decades and across the wooden bench. A circularity, a sense of completion and renewal. The call and wonder of the mountains. Message from daughter on the day we left – “Sorry I missed your call. I was at an African dance class. Hope your adventures are sublime. 52 Adventures. That's the aim. One each week. Like any real adventure the outcome is unknown. The journey, the comrades, the solitude, the challenges, the special places are what matters. And this is the record – writing, images and video. Enjoy.